Sharks and manta rays have received protection today under the Convention on International Trade in Endangered Species of Wild Fauna and Flora (CITES). CITES member nations, referred to as “Parties,” voted to increase protections for five species of sharks as well as two species of manta rays. A proposal submitted by Colombia, and co-sponsored by the United States and Brazil, to list oceanic whitetip sharks in Appendix II was adopted in a secret ballot vote with 92 in support, 42 opposed and 8 abstentions. The United States jointly submitted this proposal due to concerns that over-exploitation for the international fin trade is negatively impacting the population status of this shark species. In addition to oceanic whitetip sharks, proposals to increase protection for three species of hammerhead sharks – scalloped hammerhead, great hammerhead, and smooth hammerhead; porbeagle sharks; and manta rays were adopted by the Parties. The United States strongly supported these marine species proposals and commends the leadership of the countries responsible for their submission. 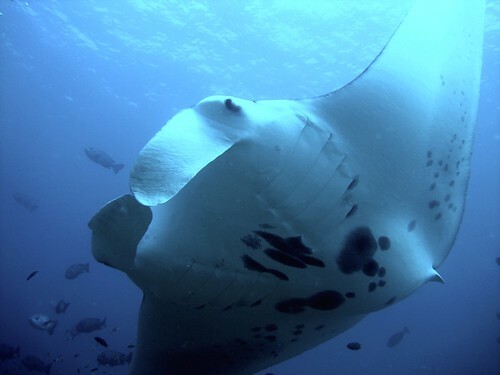 "Sharks and manta rays are extremely important to the ocean ecosystems," said Sam Rauch, of the U.S. National Oceanic and Atmospheric Administration. "The global protection that CITES offers these incredible species will complement existing international shark protection measures by ensuring their trade is sustainable and does not threaten their survival. We are thrilled these important shark and ray proposals were adopted and applaud the leadership of the many countries that helped us get there." Sharks are over-harvested in many parts of the world, primarily for their fins. Most shark fins are exported to Asia, where they are a main ingredient in shark fin soup, which is considered a delicacy in many Asian countries. Due to their low productivity and high economic value, populations of these shark species have suffered severe declines. Porbeagle sharks also face pressures due to demand for their meat, while manta rays are over-harvested for their gill plates. While some regional fisheries management organizations (RFMOs) have adopted measures to manage sharks, these regional measures alone cannot ensure the international trade of this species is globally sustainable. Not all range countries are members of RFMOs and many marine species that are traded internationally swim long distances, often crossing national boundaries. For these species, conservation can only be achieved by working collaboratively with other nations. Today’s votes place the five shark species and all manta rays in Appendix II of CITES – an action that means increased protection, but still allows legal and sustainable trade. Listing commercially-exploited marine species, especially those taken on the high sea, in the CITES Appendices has been a highly polarized and much debated issue at recent Conferences of the Parties, in part because the provisions for marine species taken on the high seas were open to interpretation. Earlier in this meeting, the Parties passed a resolution clarifying CITES implementation for marine species taken on the high seas, termed “Introduction from the Sea.” The Introduction from the Sea provisions provide CITES Parties with a clear, comprehensive framework for implementation of listings of species taken on the high seas and CITES is well-positioned to assist in securing the future of our fishery resources. CITES is an international agreement initiated in 1973 and is currently signed by 178 countries regulating global trade in imperiled wild animals and plants including their parts and products. A meeting of the Conference of the Parties is held every 2-3 years to review, discuss, and negotiate changes in the management and control of trade in the various wildlife species covered by the agreement. Species protected by CITES are included in one of three appendices. Appendix I includes species threatened with extinction and provides the greatest level of protection, including restrictions on commercial trade. Appendix II includes species that, although currently not threatened with extinction, may become so without trade controls. Changes to Appendices I and II must be proposed at a CoP and agreed to by a two-thirds majority of the Parties present and voting. In contrast, listings to Appendix III can be requested by individual Parties at any time. Appendix III includes species protected by at least one country that needs assistance from other Parties to control trade.